–Ujin Hogelun, "Rule from Horseback"
As the Unicorn’s Shinjo Shono travels along the sand road on an important mission, untold dangers await, both from the threats lurking outside Rokugan and those emanating from the Emerald Empire itself. Luckily, the Unicorn are of one mind, and the fearsome Moto will protect the future Khan at all costs. Fantasy Flight Games is proud to present “Rule from Horseback” by Daniel Lovat Clark, a new short story set in the world of Legend of the Five Rings! “Rule from Horseback” focuses on the Unicorn Clan and can be found here (0.5 MB). This story provides additional context for the Across the Burning Sands novella, which is due to be released on April 11th! 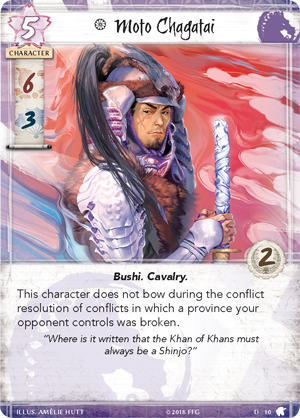 This story also features the introduction of the indomitable Moto Chagatai, who can also be found in the Warriors of the Wind Clan Pack for Legend of the Five Rings: The Card Game! Moto Chagatai (Warriors of the Wind, 10) is a fearsome warrior who will not bow during conflict resolution if your opponent’s province was broken. With the Unicorn’s massive Cavalry hordes led by Chagatai, he can easily participate in multiple conflicts a turn, and his six military skill is a threat to any clan standing in the way of the mighty Unicorn. Shinjo Shono will one day serve the Unicorn as their champion, but what awaits him along the sand road? Get a taste of what’s to come in “Rule From Horseback” by Daniel Lovat Clark, and continue the story of the Unicorn in Across the Burning Sands! Discover the power of the Unicorn in Warriors of the Wind (L5C17), available now for pre-order from your local retailer or our website and releasing on April 11th!